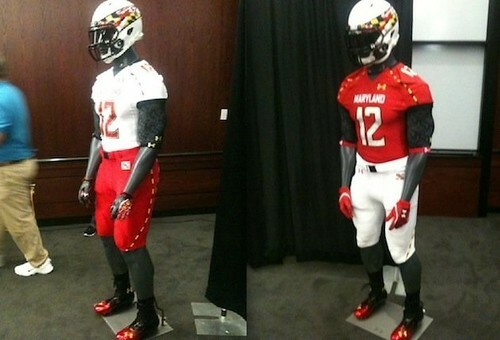 So, how would Maryland respond to the criticism of its new uniform design? 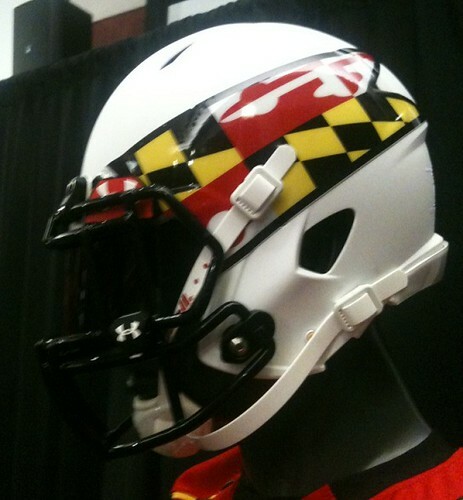 Well, without totally abandoning the overall concept of the 2011 design, the Terps have a new 2012 uniform that is not quite as obnoxious as its 2011 counterpart. Here is a quick shot of the new home (red jersey) and away (white jersey) uniforms as tweeted by @WNST on 6 August 2012. As for the helmet; while the 2011 helmet was starting to grow on me, I think the new one is better. This entry was posted in Maryland, Uniforms by Travis Normand. Bookmark the permalink.